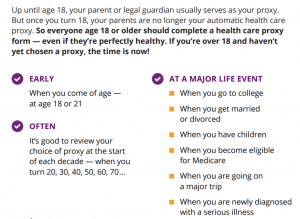 Advance Directives are documents that provide directions for your health care if you should become unable to communicate your wishes yourself, at the time that a health care decision must be made. These documents may include a living will and a health care proxy and can be filled out by anyone 18+. Before filling out paperwork, however, it is very important for patients to think about what their wishes for care would be if their illness were to progress. It’s also very important for patients, families, and their health care team to talk about what those wishes would be. For those with advanced illness, it’s also recommended that you fill out a MOLST (Medical Orders for Life Sustaining Treatment) form. The MOLST form is signed by you and your doctor. It details your decisions about medical treatments in the form of medical orders that are honored by health professionals in clinical care situations. It stays with you to communicate your choices when life-sustaining treatment may be attempted. Information and individual consultations are available to help patients and families develop advance care plans and think about MOLST. All consultations are free of charge. If you’d like to request an appointment, please contact our office at 508-825-8325. 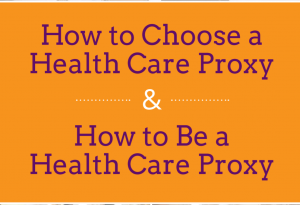 To download a free copy of the Massachusetts Health Care Proxy, a legally binding document that allows a person to name someone who would make medical decisions for him if he’s unable to speak for himself, click here. 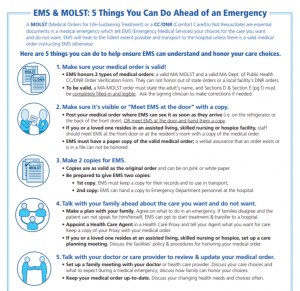 For more information on the MOLST program, click here. To read more about advance directives, click here.